Halifax’s new Central Library and Archive will be officially opened by Calderdale Council’s Mayor, Cllr Ferman Ali, on Saturday 9 September 2017. The civic event will celebrate the opening with a range of events and family activities to mark the occasion. “I’m delighted that the new Central Library and Archive will officially open to the public during the annual Heritage Open Days, since it incorporates some of Halifax’s most memorable landmarks into the new, purpose built, state-of-the-art library facilities. This will be our flagship library which will provide a modern, digital space for the borough. First time visitors to the new Central Library and Archive will have the chance to tour the building, from the local studies section and the West Yorkshire Archive search room on the lower ground floor to the adult non-fiction collections on the second floor. Younger readers will be able to explore the new children’s library on the ground floor, close to the reception and new Visitor Information Centre. Older readers can browse the adult fiction on the first floor whilst 13 to 16 year olds can relax in their own special area next to the digital media section. There will also be an opportunity to admire the beautifully restored Square Church rose window and enjoy upward views of the tower and spire from the staircase. In the evening there will be a public performance by Simon Zonenblick and Caroline Lamb, who featured in the Branwell Bronte documentary a Humble Station, comprising a live performance of Branwell’s poetry with harp accompaniment. Tickets will be available from www.eventbrite.co.uk(external link) shortly. 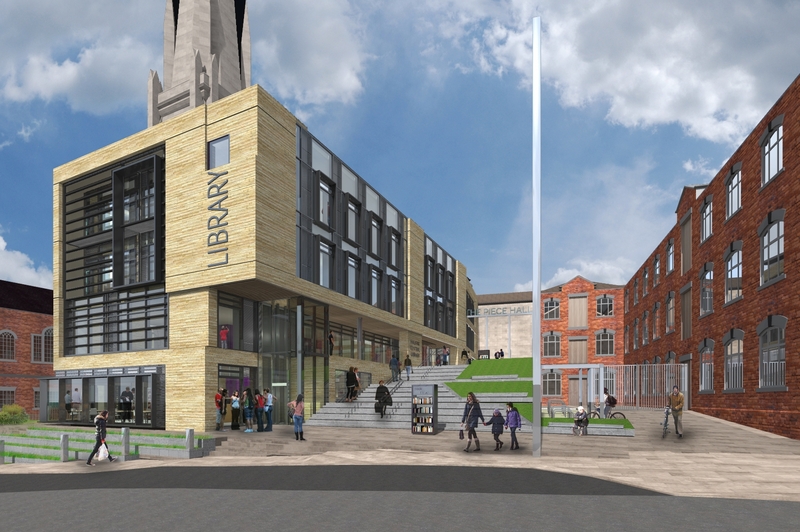 The new Central Library and Archive has been wholly funded by Calderdale Council. To find out more about the civic opening and the new Central Library and Archive visit our website or follow Calderdale Libraries on Twitter @CMBClibraries.